Any pediatrician will tell you that having a firm, well-fitting, crib mattress is essential for the healthy development of your child. All modern crib mattresses generally follow this recommendation, but finding the best crib mattress can be anything but restful. We gathered the 10 best crib mattresses that will help you and your baby get a better night’s sleep and ordered them by their overall customer rating. We also considered firmness, longevity, and composition – whether it’s hypoallergenic, organic, or eco-friendly – when analyzing these products. 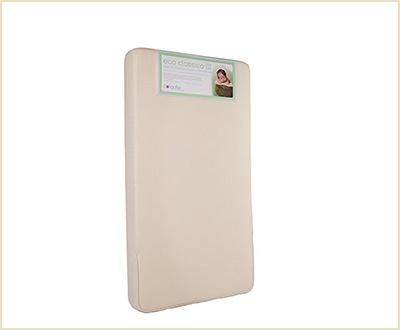 This is a hypoallergenic and waterproof crib mattress with an extra firm soy foam core. It won the Women’s Choice Award three years in a row and is gold-certified for indoor air quality. 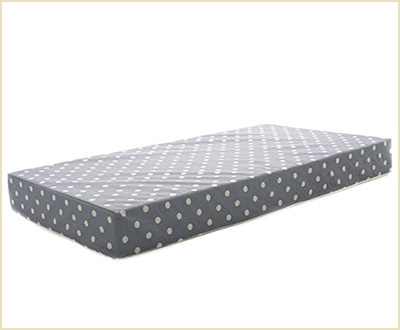 It’s one of the best baby crib mattresses you can buy and fits a portable crib perfectly. The coils add to the longevity of this mattress. Fits safely inside a portable crib; no space left in corners, no lifting, bunching, or folding. Heavier and more expensive than most. Might be too small for a normal crib – always check dimensions! Some customers reported some shrinking after a few months of use. 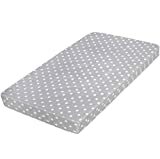 Bottom line:Parents looking for a firm and safe portable crib mattress that doesn’t feel hard or uncomfortable will find this is one of the best crib mattresses for them. 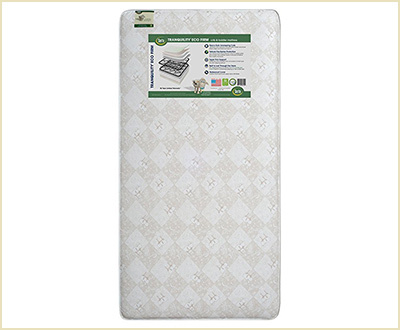 With three safety certifications, this coil spring mattress is definitely a good buy. It’s firm, hypoallergenic, and waterproof, with an orthopedic design to help your baby have an amazing night’s sleep. Just like most mattresses on this list, ths one also has dual firmness, thus saving you money on a toddler mattress down the line. A resilient mattress that provides the right support for toddlers. More environmentally-friendly than most mattresses. Great with temperature control – the baby will never overheat. It is not made from 100% natural materials. Might be too soft for heavier toddlers. Some customers report it’s not sturdy enough for babies who are very active throughout the night. Bottom line:It’s the best crib mattress for environmentally-conscious parents looking for a reliable option the will fit the crib or toddler bed snuggly. 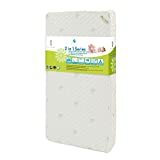 The Dream on Me portable crib mattress is one of the best crib mattresses if you’re budget conscious and have a portable crib or mini-crib. It has firm inner springs with a hypoallergenic waterproof cover. It was designed for use in smaller “mini” cribs and will fit snuggly and safely in portable cribs. However, it is not suitable for standard size cribs. Waterproof, therefore extremely easy to clean. Not suitable for standard size cribs or toddler beds. Tends to sag under heavier babies and reveal uncomfortable coils. Some parents consider it too soft for babies. Bottom line:If you have a mini-crib or a portable crib to save space, this mattress will fit well and give your baby a good night’s sleep. 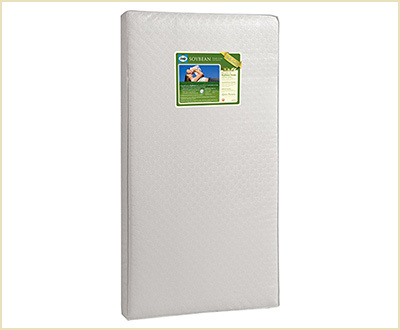 This foam mattress comes with a removable (waterproof) cover that has a breathable bottom panel to promote air flow. It’s a budget-friendly solution will fit any standard size crib. Sadly, it is not a “dual firmness” mattress, meaning that while it might be the best crib mattress for your infant, it will likely be too hard for them once they’re a toddler. Inflates immediately and is completely smell-free. It does not have dual firmness. It’s made from synthetic materials. Some customers report the cover not being waterproof. Bottom line:Ideal for budget-conscious parents in need of a breathable and water-resistant mattress. Note: Since you’re here, you should also check out our article on the best overnight diapers that will hopefully help you get a good night’s rest. This is easily the best organic crib mattress on the list. It’s made with plant-based oils instead of petroleum-based ones and features waterproof backing and inverted seams for extra convenience and a sleek appearance. Suitable for both babies and toddlers, this Colgate mattress also boasts an organic cotton cover and is GREENGUARD certified, which means it is the best crib mattress for safe indoor air. 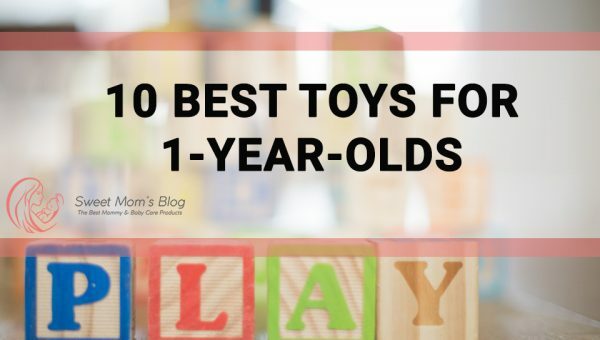 Suitable for both infants and toddlers. Has the perfect firmness on both sides. 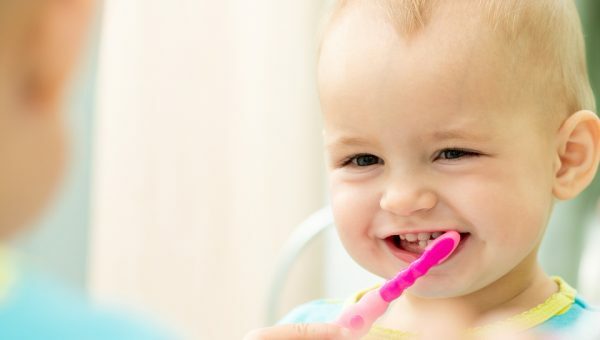 Although eco-friendlier than previous crib mattresses from Colgate, there are few (if any) hints to it being organic. Some customers reported a distinctive chemical smell coming from this mattress. Bottom line:Those looking for the most comfortable dual firmness organic mattress will definitely love this model. This is a dual firmness mattress that combines both innersprings and foam. Because the core of the mattress is made of springs which are covered in layers of foam, it’s firm enough to be safe for your baby yet soft enough to be comfortable. Resilience, comfort, and safety for a reasonable price. High-quality product that is completely silent while the baby or toddler twists and turns and has no gaps, loose threads, or safety hazards. Low chemical emissions; made without PBDE flame retardants, mercury, lead, etc. 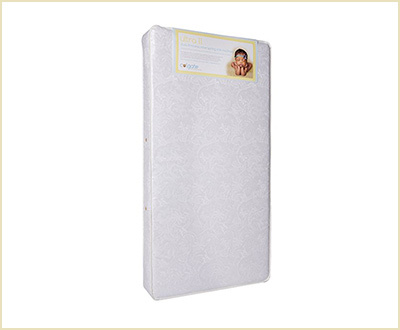 Bottom line:Parents looking for a safe and reliable crib mattress for an affordable price will love this mattress. 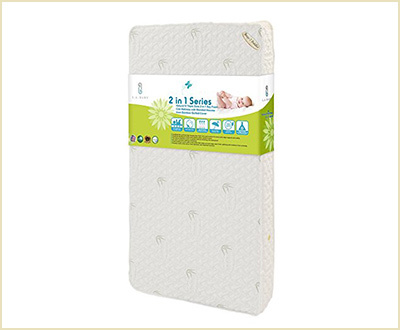 If you’re looking for the best crib mattress for both babies and toddlers, this “2 in 1” mattress might be for you. Because it’s firm on one side and soft on the other, once your baby is old enough to transition to a toddler bed all you have to do is flip their mattress over for a more comfortable experience. The soy foam core and waterproof bamboo cover are just the icings on the cake. Comes with a naturally hypoallergenic cover. Even though most parents agreed it has the perfect firmness, some might consider it a bit “flimsy”. 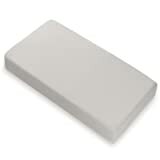 Even though advertised as a natural crib mattress from organic soy foam, it also contains polyurethane foam. Bottom line:The best crib mattress for parents who are looking for a comfortable and natural option. 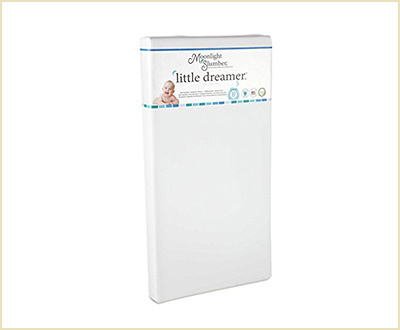 This affordable memory foam crib mattress is made for standard cribs and is made of CertiPUR-US certified polyurethane foam. This mattress also exceeds CPSC and flammability standards and comes with a removable waterproof mattress cover that is soft to the touch. Low cost and space saving. Hypoallergenic, mite-proof, anti-microbial, and phthalate- and lead-free. Some customers report the mattress did not expand properly after unboxing. Some others noticed it tends to sink in a bit after a few months. The mattress seems to take a while to get rid of the chemical smell. Bottom line:Parents looking for an inexpensive mattress that is safe for newborns. 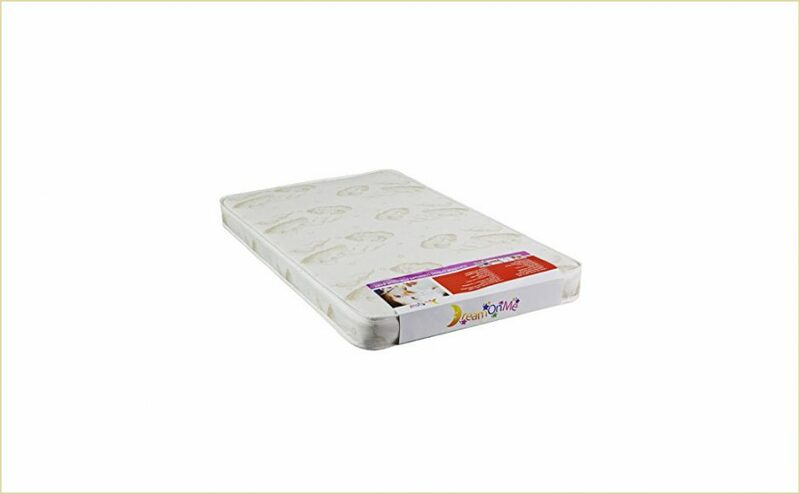 This is a dual firmness mattress and is suitable for use in both toddler beds and cribs. It is antimicrobial, waterproof, and hypoallergenic. It is also gold certified to have low chemical emissions, which means both you and your baby can rest. 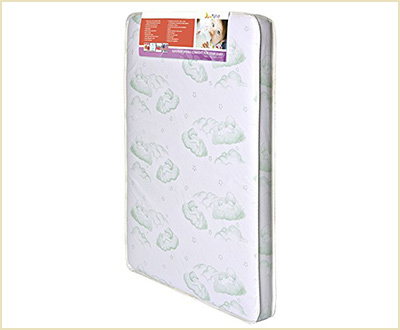 The most comfortable mattress both for toddlers and infants; provides comfort on one side and firmness on the other. Side stitched, so there are no crevices on the surface of the mattress. Some customers report a strong vinyl smell. It also has a big price tag. This memory foam mattress will definitely give you the most bang for your buck. The mattress has a different firmness on either side, making it suitable for both infants and toddlers. 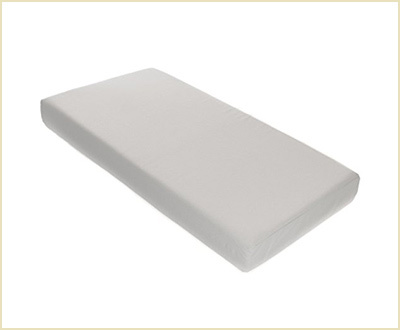 The memory foam promotes proper posture and the soft cotton cover is removable and washable. The cover is also hypoallergenic and attractive enough to be used without a crib sheet. A very affordable hypoallergenic mattress. Fits perfectly in a standard crib and is completely smell-free after a few days. Highly resilient to pressure, does not sag. The cover is water-resistant, but not waterproof. 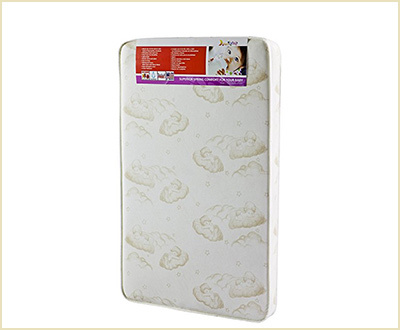 The mattress is made from synthetic materials which can cause the infant to overheat and get rashes. Some customers found the mattress too firm for a baby. Bottom line:The best crib mattress for a budget conscious parent who wants comfort and quality for their baby long term. Safety, comfort, and size are just some of the variable to consider when buying a crib mattress. We gathered the best-rated crib mattresses and ordered them by their overall user rating so you can make the right choice. What do you think of our top? Is your favorite crib mattress on this list, or should we expand it?